Morks is a contemporary Thai restaurant, which has recently relocated to the Kingston Foreshore from its previous location in Florey. The seating capacity has greatly increased and it is now a modern-looking, minimalist restaurant with a simple colour palette and a striking red feature wall. I wrote in my first review of Morks back in June 2012 that it was my restaurant of choice when interstate friends and family were visiting. Almost two years later, in April 2014, I'm still recommending Morks as the go-to restaurant to showcase excellent food in Canberra. A friend from Sydney was visiting Canberra recently and only had time for one lunch catch up. He was in the mood for good Asian food, so naturally I suggested we go to Morks - which has the added bonus of foreshore views. He ordered the chicken mince with basil leaves and chilli, steamed rice and poached egg dish ($16). The egg was poached perfectly and the well-balanced flavours of the wok-tossed chicken mince surpassed my expectations. I ordered the Massamun Burger - slow cooked beef chuck with spicy salad and shoestring fries ($16). I already knew the Massamun beef at Morks was amazing, and I couldn't resist trying the burger version! I was not disappointed. The rich, saucy filling lent itself to being held together between two absorbent burger buns. My Sydney friend was impressed by Morks' innovative menu and its beautiful location, saying he would be keen to make more trips to Canberra in the future! In quick succession, I was back at Morks for dinner to try out their flagship menu. The service on this particular Thursday night was as warm, welcoming and friendly as it has always been, despite the fact that all the tables (in an expanded venue) were occupied with patrons. My dining companions decided that the tasting menu ($85 with wine/$60 without) looked too good to pass up. As it was a weeknight, we all gave the matching wines a miss, preferring to order drinks separately. The Bennetts Lane NV Brut was a light and crisp sparkling and a perfect first drink. I also had a sip of Linda's lychee lime and bitters. It was sensational - and has become my new favourite non-alcoholic beverage. The tasting menu kicked off with pan seared scallops and pig ear terrine. The pig ear component was marinated beautifully and the texture was unique and delicious. I've had pig ear before and knew what to expect - gelatinous and slightly crunchy. 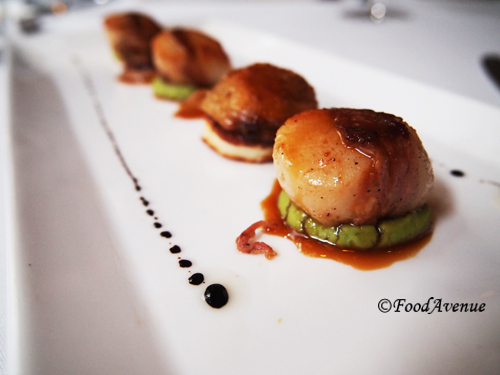 The scallop was caramelized on the outside, soft and tender on the inside. The textural combination of the delicate scallops paired with the unique pig ear terrine signalled a captivating start to the tasting menu. The second course was a salad of crispy rice seasoned with red curry paste, grilled cured pork, Thai herbs, roasted coconut, and dried hot chilli. While the cured pork looked a bit unfortunately like grilled spam, it tasted nice and I loved the overall flavours of the crispy rice salad. The balance of sour, spicey, and salty flavours was genius. The addition of onion and coriander turned the dish into a salad, which worked wonderfully. Up next was the braised pork belly with crackling, English spinach, boiled quail eggs served with five spice pork reduction, chilli and garlic relish and rice fried with basil and chilli. The pork belly was, as always, faultless. A magnificent constructional feat, the pork belly looks like a savoury version of a layered cake. I still maintain (as I did in my original review of Morks) that the fried rice could (and would be better) replaced with plain steamed rice as the bold flavours of the fried rice tends to compete with the flavours in the reduction and the pork. In the whole scheme of things, a very minor issue and the dish is overall very enjoyable. The last dish was creatively called "Egg in Hay" - the egg-shaped homemade coconut icecream sat in a nest of roasted coconut and condensed milk, concealed by a pile of pashmak (Persian fairy floss). The dairy-free ice cream was creamy and surprisingly thick in texture. Flaky roti added a contrasting crisp texture to the dish. As I was eating this heavenly dessert (and best dish of the night), I kept thinking, "I don't want this to end!" I feel like the Morks leadership team has really come into their own in their new venue. They have stayed true to what Morks in Florey was all about by keeping popular menu items and not letting the hospitality slip. And they have also continued to experimented with exciting new dishes and come up with the beautiful Egg in Hay dessert. It is easy to see that the people at Morks are passionate about developing great food and care about the dining experience for their patrons. What more could you want? When I arrived at 6:30pm, the restaurant was already lively and customers inside were chatting away animatedly. In fact, it was so lively that my companions had managed to nab the last table. Unfortunately, it was also the worst table as it was the one closest to the door and we felt every icy gust of wind as more customers continued to come into the restaurant. The clientele appeared to be made up mostly of other Asians. I could hear various Asian languages being spoken from the nearby tables. I had a good feeling about this place. I didn't think Arirang had been open in Civic for very long. Sure enough, when I had a look at the menu, it looked like it had been taken straight from the Gungahlin shop as there was no mention of the Civic address. We decided to order the Special Beef Soup ($40) and the Pork Bulgogi ($17) to share between the three of us. The accompaniments arrived first. I was impressed by the kimchi. To be honest, I have no idea what authentic kimchi is meant to taste like, but I thought this had just the right amount of chilli, no odd smell from the fermentation process and the vegetables tasted extremely fresh and crisp. It had the perfect balance of flavours between sourness, saltiness and sweetness. The pickled radish was delightfully moreish and I could have easily eaten a whole jar of it. From what I could tell, the third accompaniment was dried tofu that had been lightly pickled. Next, a portable stove was delivered to the table, with the beef soup placed on top of the stove. The aromatic, steaming soup was extremely comforting on such a cold night. It was a robust soup with strong, well-balanced flavours. Korean food is famous for its marinated meats and this was no exception. I could tell the beef had been pre-marinated before it went into the soup and it added another dimension to the hearty soup. The pork bulgogi arrived shortly after, sizzling on a hot plate. It had also been pre-marinated and was covered with a sticky, barbeque-like sauce. I loved the punchy, intense flavour of this dish. It went down very well with the steamed rice! On a particularly cold and windy Canberra evening, this Korean restaurant made me feel warm and cosy as soon as the food arrived. I no longer noticed the gusts of wind that was let in by the opening and closing of the door - I was too preoccupied with the delicious food! Arirang Korean Restaurant is open only in the evenings. By day, it is a normal coffee shop called Blend Cafe. I wondered if this meant there were two vendors cleverly renting out the same space. However, a quick question to the wait staff confirmed that the owners of Arirang were also the owners of Blend Cafe. I think it's a very inventive business model - capitalising on the needs of the office workers in the surrounding area during the day, and then servicing the night crowd of the nearby ANU students in the evenings. The wait staff were very responsive and friendly. The food tasted amazing and was kept constantly warm through a portable stove or a hot plate. I can't wait to come back and try more dishes from this restaurant.